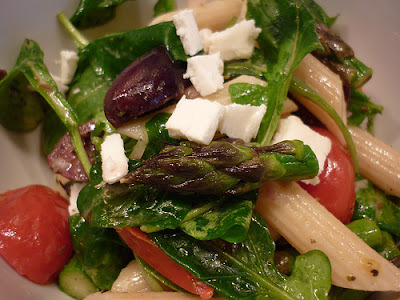 with a few changed ingredients, you can make your pasta salad healthy. Healthy weight loss is different for everyone. For me I have issue with the Carbohydrates. Atkins and the South Beach Diets worked wonders for me - in getting off that belly fat! Low calorie diets actually make me gain weight because my metabolism thinks it is starving and thus, holds on to that FAT. Isn't that nice? Then there is the science of it all - and it's like anything in life - it's all about a healthy balance. Include in your diet, healthy nutritious foods - they don't have to be expensive. And as I have said before, Food Banks DO include fruits and vegetables and I know that if you are on "food-stamps" or Cal Fresh or something like that, you get a EBT card and you can buy your fresh foods. They offer more healthy choices than they used to. Here's a basic chicken pasta salad that won't break your budget. And you can customize it to what you have on hand. 1. Boil, bake or broil your chicken breast and shred when cool enough to handle. 2. Prepare pasta according to package directions. Rinse in cold water and drain well. 3. Slice tomatoes and olives in half. Slice onion and chop basil. Squeeze 1 T of lemon juice from lemon. NOTE: Don't stress out if you don't have the fancy yellow cherry tomatoes. Any tomato will do. If you don't like feta, don't worry about it. And if you don't have pine-nuts, try almonds or walnuts. or none at all. Same goes for capers. 4. Gently toss all ingredients together with the chicken and pasta. Refrigerate and serve. You can make a larger portion and eat on it for a few days. Also if you are like me, and need more protein, then add more chicken breast! This looks so super yummy! My mouth is watering. I love this.